From Chicago I flew to New Jersey to vist my family and attend the CREATE event. At Newark airport I was greated with this sign, which always makes me laugh but this time the more, since United let me check in an empty suitcase – as the full suitcase in the empty suitcase was 3 pounds too heavy. I was asked to pay 120 Dollars extra- so I just opened the bigger suitcase and took out my smaller suitcase and checked in the extra empty one for 35 Dollars. No need to voice my opinion- as always… a pleasure flying with you, United Airlines! I had an amazing time with my family and friends- I miss them so much- family dinners, days playing with the kids, having fun times with my sis in law heading to antique stores, some fun time with my parents in law, an afternoon with my friend Joe, a lunch with my friends Bill and Karen – it was wonderful and I hope I see them soon again. The classes at Create started with an amazing inspiring sight- at our hotel took also an Indian Wedding with four hundred guests place. The clothing and colors, the music, the smell of yummie spices – AMAZING! My first class with Michelle Ward. I so love her work for many many years- and it was awesome to finally meet her and take a class in person. I had lot’s of fun. I wrote about why I think it is good as a workshop teacher to step once in a while into the shoes of a student in my July newsletter. I absolutely loved the time in those shoes :) I will show you my finished book later- I need to finally get some studio time. The next day I took a class with Jenn Mason – Monoprinting with the Gelli Arts Gel Printing Plates– lots of fun- and can’t wait to play more! 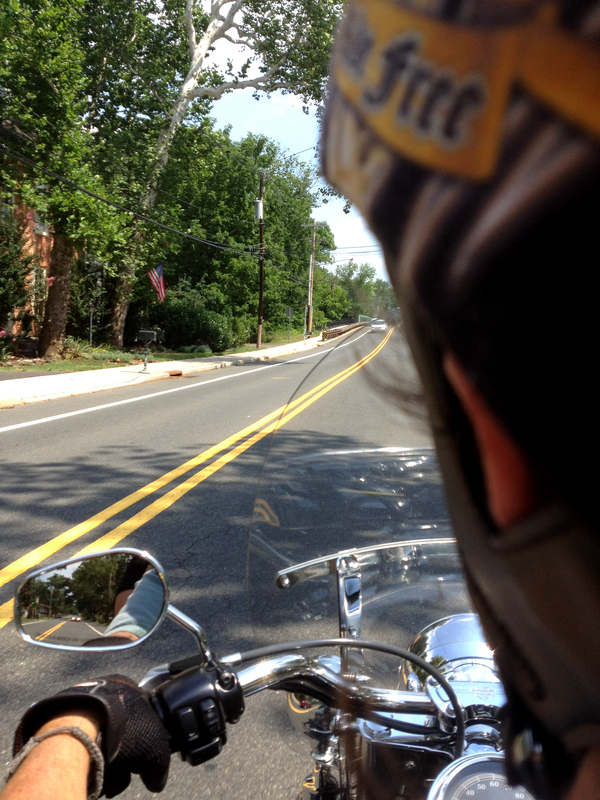 It was a whirlwind visit in NJ – but I loved going on a little motorcycle ride with my brother in law- he so rocks :) right before heading out to the airport. That’s it , you made it through gazillions of posts about my travels. Thanks for letting me share! What was the last Workshop topic you have taken a class for? Well that sounded like an all around great trip! I had actually never taken a “live” workshop until last week when I took Finnabair’s class! I really must do it again! The last workshop (sadly such a long time ago) was on the Tattered Angels products and it was with YOU! I absolutely loved the workshop and it actually got me started in mixed media! That wedding looked so colorful and I bet the spices were wonderful to smell! As always, thanks for sharing your photos of your travel journeys Nat. Yes, teachers should take classes to remind themselves of what it is like to be a student. I enjoyed the video from yesterday. Sad and beautiful at the same time. The last class I took in person was a zentangle one. I am excited to be signed up for one of Julie’s classes at AE later this month. Carrie- your book was the best though- so amazing! I had the best time that day – it let breathe and live in the creative moment. Would love to re-live too :) It was also awesome to meet you !!! Looks like you had such a great time. i lived in NJ for years! Fabuloso todo el viaje, que maravillosa experiencia los talleres y esa boda india con tanto color, menuda fuente de inspiración. mi ultimo taller que estoy tomando es on line y contigo los sellos de foam, y ahora que he vuelto de vacaciones me voy a organizar y empezar a hacerlo.